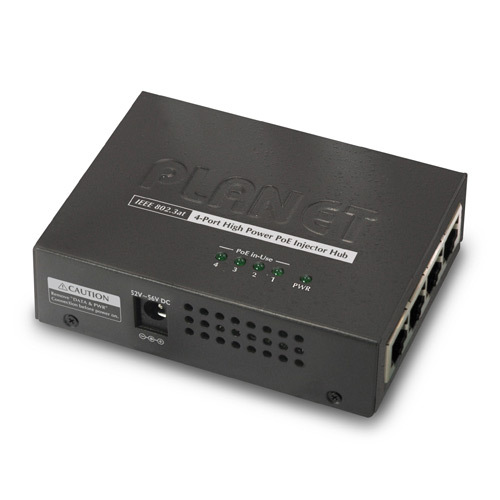 PLANET HPOE-460 is the next generation 4-Port Gigabit High Power PoE injector Hub, featuring both IEEE 802.3af and High Power IEEE 802.3at PoE standard that combines up to 30-watt power output and data per port over one CAT 5/5e/6 Ethernet cable. The HPOE-460 is designed specifically to satisfy the growing demand for higher power consuming network PD (powered devices) such as PTZ (Pan, Tilt & Zoom) / Speed Dome IP cameras, multi-channel (802.11a/b/g/n) wireless LAN access points and other network devices in SOHO and SMB network applications. The IEEE 802.3at Power over Ethernet standard is defined to provide each PoE device maximum up to 30 watts of input power which is double amount of PoE power, more than the conventional 802.3af PoE PSE. The IEEE 802.3at PoE standard is an ideal solution to meeting the high power requirements directly via the RJ-45 Port interface. Compliant with IEEE 802.3at, the HPOE-460 possesses stronger power capability than the existing 802.3af PoE PSE. With 4 10/100/1000Base-T Gigabit Ethernet ports, the HPOE-460 supports 52V DC power for any remote 802.3af / 802.3at powered device (PD) without affecting data transmission performance. Supporting PoE power budget of 120 watts, the HPOE-460 provides sufficient 15.4 / 30.8-watt PoE power to up to 4 remote PD devices. It offers a cost-effective and quick solution to upgrading network system to IEEE 802.3af / IEEE 802.3at Power over Ethernet system without replacing the existing Ethernet Switch. There are 8 RJ-45 STP ports on the front panel of the HPOE-460, in which 4 ports in the right direction function as “Data input” and the other half in the left direction function as “PoE (Data and Power) output”. The 4 “PoE (Data and Power) output” ports are also the power injectors that transmit DC voltage to the CAT. 5/5e/6 cable and transfer data and power simultaneously between the Injectors and Splitters. The HPOE-460 provides the easiest way to power your Ethernet devices such as PTZ / Speed Dome IP camera on the ceiling, the wireless access point installed on the roof of the building and the PoE IP phones in the office. With 4 10/100/1000Base-T Gigabit Ethernet ports, the HPOE-460 supports full 52V DC power for any remote IEEE 802.3af / 802.3at powered device (PD). Furthermore, the HPOE-460 can be directly connected to any third party IEEE 802.3af / 802.3at compliant devices installed 100 meters away and allow the administrator to centrally control the power system of the networking devices. 2012-12-14 2.0 Release for Hardware version 2.0.